Perfect for making pickles, saurkraut, kimchi, and other lacto-fermented vegetables! Also great for fermented beverages like kefir and Kombucha! Just Pickl-It! 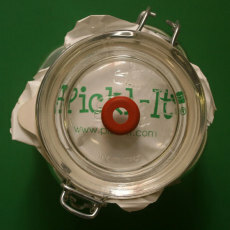 Pickl-It is the original anaerobic fermentation jar, perfect for making a whole range of fermented foods and beverages! 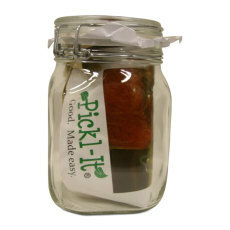 This is a 1 L Pick-It jar that comes with the Italian-made glass jar, a lead-free bale, grommeted glass lid, a three-piece airlock, and a Plug'R to plug the grommet during storage in the refrigerator. Also included is a Pickl-It manual with instructions and recipes! These jars are great for a range of beverages such as kefir and kombucha, as well as a whole host of pickles, saurkraut, kimchi and lacto-fermented vegetables! 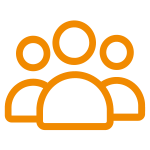 Get started making your own healthy probiotic creations with Pickl-It today! The original anaerobic fermentation jar!